Do you remember that time you were posting pictures of burgers on Instagram and, thus, forgot to have a family? This, for all intents and purposes, sums up the bizarre premise behind the latest sub-standard "viral video" spreading across the internet. 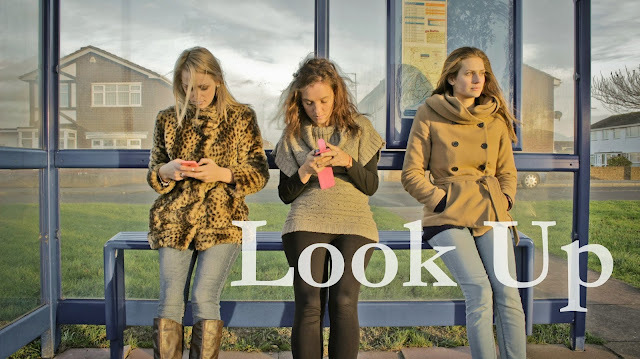 Look Up, a video which would make for an adequate A-Level project but no more, is described, with arrogant hubris, by its creator Gary Turk as a "Spoken word film for my generation". Over its five minute running time he proposes that mobile internet devices are making us lonely, stifling creativity, crushing our souls and teaching us to forget how to live. And boy, is this hammer handed film bad. We are introduced to Turk with a straight on shot of his visage. "I have 422 friends but I'm lonely." This is the pseudo-profound statement which sets the tone for all to follow. Perhaps his acquaintances would like to hang out more if Turk spent less time making self-indulgent tripe like Look Up? The poetry, which is read with the passion of a catatonic sloth, is rather amateurish too. Another suggestion - maybe Turk should spend more of his smartphone-free time reading Keats or Blake? Cloyingly sentimental, puerile, juvenile and the worst kind of mawkish, naive sermonising, Look Up could easily constitute the worst film shown to the public this year. Turk whines and whines with lines full of nonsense. "All this technology we have is just an illusion" - well, its clearly not is it? Even more frustratingly to the viewer, Look Up is clearly designed with "going viral" in mind - hypocritical as well as short-sighted. It's as cynical as any advertisement created to sell us things we don't need. Like smartphones, for example. Look Up suggests that we need to stay off-line in order to experience "real" connections. It's not like a youngster struggling with depression, or looking for advice before coming out, could ever gain anything useful from speaking to others with share experiences on the web. And, as apps and sites such as Tinder and POF rise in popularity, it also seems peculiar to suggest that real, and long lasting, connections can't initially be made through digital means in the Twenty First century. Mr. Turk seems to suggest that the most revolutionary thing someone can do in society is to have kids. If, as his video suggests, spawning offspring or running social media channels are mutually exclusive, I'd suggest he were incredibly wrong. One look at the Facebook profile of any new parent would disprove his theory. Sadly, the film accidentally acts as a remarkable barometer of our times. That such a banal, mediocre video has become so wildly popular is a saddening illustration of an unthinking society who don't want to be troubled by anything as difficult as nuance or subtext - emotive music and an easily digestible message are all that is needed. Even more remarkable is that much of the success of Turk's film has come from it being mindlessly shared and liked on Facebook, Twitter, et al. Perhaps this is one instance it would have been better for us, collectively, to Look Up.